LONDON -- The British satellite company Inmarsat, which has provided investigators the only satellite data available on the final hours of missing Malaysia Airlines Flight 370, has told the BBC that it located a "hotspot" where the jet likely crashed more than 100 days ago, but the area has not yet been searched. Inmarsat's team of engineers determined through analysis of the final communications between the Boeing 777 and their satellite that the jet likely came down in an area to the southwest of a zone scanned carefully by Australia using a U.S. Navy robotic submarine. 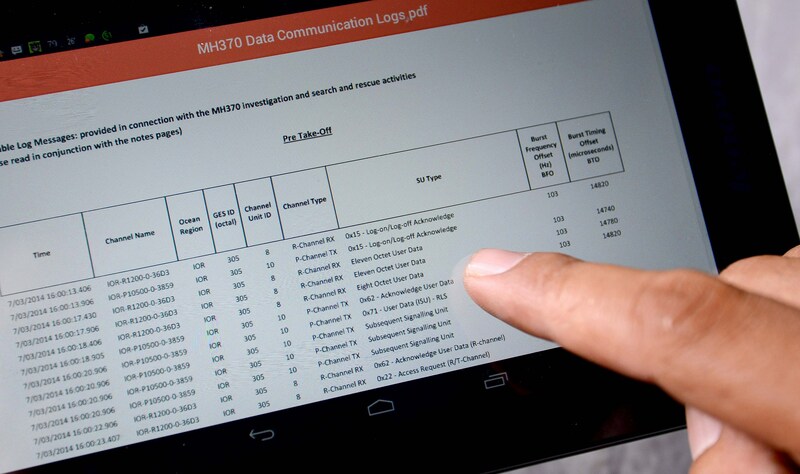 The Australian ship sent to investigate the region never made it to Inmarsat's "hotspot" because other vessels detected auditory "pings" which investigators believed could have come from Flight 370's black boxes. The search focused on the area where the pings were detected for two months, but nothing was found. "It was by no means an unrealistic location," Inmarsat's Chris Ashton told "Horizon," a BBC news magazine program. "But it was further to the north and east than our area of highest probability." Experts at Inmarsat mapped out a set of arcs over the southern Indian Ocean based on the last "handshakes" sent from the plane's communication equipment to the satellite. "We can identify a path that matches exactly with all those frequency measurements and with the timing measurements and lands on the final arc at a particular location, which then gives us a sort of a hotspot area on the final arc where we believe the most likely area is," Ashton told the BBC. The search for the missing plane is on hiatus while ships map the ocean floor across a vast swath of the ocean off Australia's west coast. Inmarsat told CBS News on Tuesday that the "hotspot" would be targeted when the hunt resumes, which is expected to happen in the next several months. Inmarsat representative Katie Potts stressed to CBS News on Tuesday that the company's "analysis is just one element of a collaborative effort," and there were still no guarantees. "Because there are many uncertainties due to the lack of aircraft performance and tracking data, a specific final location in the Southern Ocean cannot be identified," Potts said in a written statement.